There are many kits available to today’s hobbyists who wish to try their hand at producing simple computer-controlled robots. Small concoctions of servos and laser-cut acrylic, to which boards such as the Arduino, Raspberry Pi, or Beaglebone can easily be fitted. In the 1980s though this was a market that was yet to be adequately served. The sheer size of the many 8-bit machines of the day meant they could not be incorporated in your robot, and interfacing to them was a bit more challenging than the easy-to-use GPIOs of their modern counterparts. Then the mechanical hardware of a small robot was something that had not been easily and cheaply packaged for the constructor, making building a physical robotic platform a significant task in itself. [Jeffery Brace] and [Evan Koblentz] write for IEEE Spectrum about their work at New York City’s World Maker Faire back in October, making a pair of small robots using only components and computers available in the 1980s. 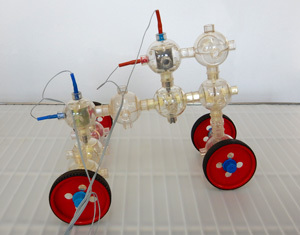 [Charlie] is a robot based on the Capsela construction system, a toy consisting of interlocking plastic spheres containing different functions of shafts, gears, and motors. There was a Robotic Workshop kit for Capsella that featured a Commodore 64 interface, and it is through this means that [Charlie]’s three motors are controlled. It includes a ROM that extends Commodore BASIC with extra commands, which allow the robot to be easily controlled. 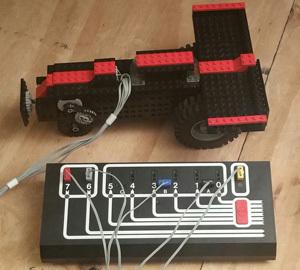 Meanwhile [Artie] is a Lego robot, using the Dacta TC Logo, a kit sold for the educational market and available at the time with interfaces for the PC and the Apple II. They had a Dacta control box but not the Apple II card to go with it, so had to make do with a functional replica built on a prototyping card. As the name suggests, this was programmed using Logo, and came with the appropriate interpreter software. Both robots are reported to have been a success in terms of working in the first place, then demonstrating the 1980s technology and providing entertainment and engagement with the faire’s visitors. We have covered numerous Lego robots over the years, as a search of our site will confirm. But this is only the second time we’ve featured a Capsela project, the first being this Arduino rover from 2011. [Mike] mused why we don’t see Capsela more often, and the same sentiment is true today. Do you have a Capsela set gathering dust somewhere that could make a robotic project? 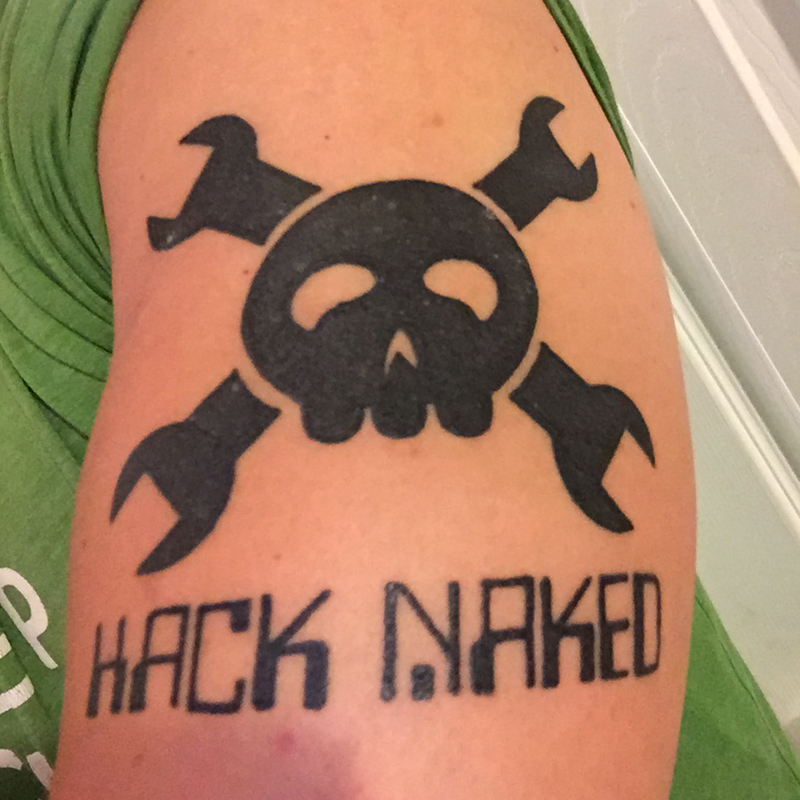 [Philip] got a tattoo of the Hackaday Skull ‘n Wrenches. His job is mostly office work in long sleeves, so everything’s good. The original logo was drawn in Flash by [Phil Torrone] of Adafruit, and reworked into a slightly more modern file format by [Elliot]. Yes, a skull and wrenches is a biker symbol and can be found in the emblem for a few military divisions (mostly for armored support). 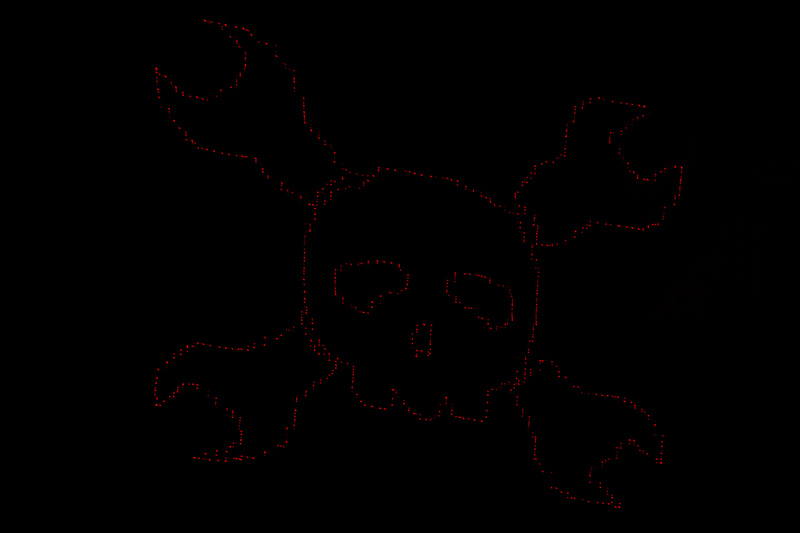 The Hackaday logo is by far the most cartoonish of all of these Jolly Wrenchers. 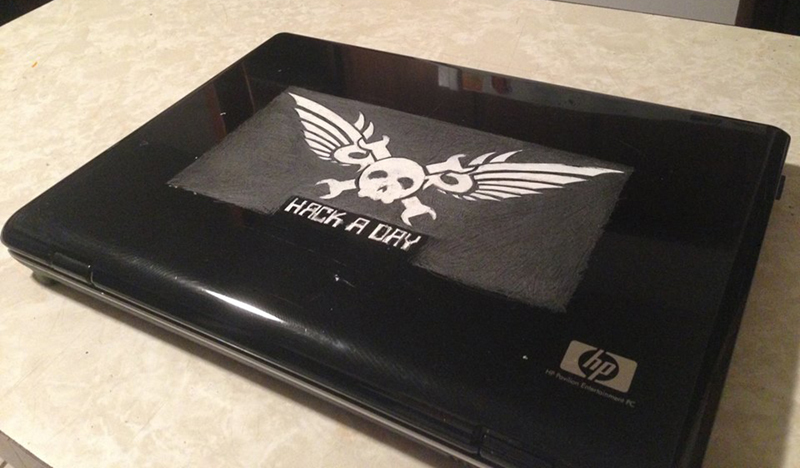 Speaking of scrawling the Hackaday logo on stuff, [Rodrick] was bored and needed a distraction last Saturday night. You want a fail? This is a fail. [Chris] is working on a device that combines the familiar Arduino pinout with a CAN transceiver. A good idea, but if you build a PCB, you’re going to need traces. [Chris] sent his files off to our favorite purple board house and got back a sheet of copper laminate with holes in it. A good reminder to check your Gerbers before sending them off. Live around Denver? There’s a hackerspace in Broomfield, Colorado that’s looking for a new space. They have a Kickstarter for the lease and they’re looking for some people to fill their space. You kids out there with Pro Tools and Logic don’t know how good you have it. Back in the day, audio was recorded on magnetic tape with exacting mechanical devices called multitrack recorders. [Fran] fished her Otari 8-track recorder out of storage, and it’s a thing of beauty. Also out of storage is a 300 lb+ plate reverb. The Hack-a-Day logo challenge keeps on bearing fruit. This tip comes from [Enrico Lamperti] from Argentina who posted his follies as well as success creating a Hack-a-Day logo using a home built scanning laser projector. The build consists of a couple small servos, a hacked up pen laser and an Arduino with some stored coordinates to draw out the image. As usual the first challenge is powering your external peripheral devices like servos. [Enrico] tackled this problem using 6 Ni-MH batteries and an LM2956 simple switcher power converter. The servos and Arduino get power directly from the battery pack and the Arduino controls the PWM signals to the servos as they trace out the stored coordinate data. The laser is connected to the servo assembly and is engaged and powered by an Arduino pin via an NPN transistor. He also incorporated a potentiometer to adjust the servo calibration point. His first imported coordinate data generated from some Python script was not very successful. But later he used processing with an SVG file to process a click-made path the Arduino could use as map data to draw the Hack-a-Day logo. It requires a long exposure time to photograph the completed drawing in a dark room but the results are impressive. It’s an excellent project where [Enrico] shares what he learned about using Servo.writeMicroseconds() instead of Servo.write() for performance along with several other tweaks. He also shared the BOM, Fritzing diagram, Processing Creator and Simulator tools and serial commands on GitHub. He wraps up with some options that he thinks would improve his device, and he requests any help others may want to provide for better performance. And if you want you could step it up a notch and create a laser video projector with an ATMega16 AVR microcontroller and some clever spinning tilted mirrors. [Toymakers] shared another episode of The Rabbit Hole. In this episode they spend most of the time pawing through boxes of donated electronic goodness. What really sparked our interest in episode 044 starting at the 12:46 mark was their amazing new logo proposal for The Rabbit Hole Hackerspace. The logo looks a bit familiar and is indeed based partly on the Hack a Day logo, but this unique and awesome logo also sports the open source hardware gear as well as an evil looking punisher style rabbit. Sure we might like it a bit more because of its resemblance to our logo; nonetheless this is a great-looking logo and perfect for their hackerspace. We hope they go with it, who doesn’t love evil rabbits? The background to the logo is also a barcode which when scanned takes you to The Rabbit Hole website. [Whiskers] also re-renders the logo to port over to their CarveWright CNC wood router to make up a 3D logo plaque, SWEET! You might remember we did get a glimpse of their table-top CNC router as a Hackaday Hackerspace Henchmen entry.